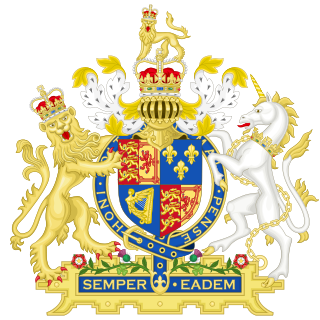 The Kingdom of England (Anglo-Norman and French : Royaume d'Angleterre    ) was a sovereign state on the island of Great Britain from 927, when it emerged from various Anglo-Saxon kingdoms until 1707, when it united with Scotland to form the Kingdom of Great Britain. The Interregnum was the period between the execution of Charles I on 30 January 1649 and the arrival of his son Charles II in London on 29 May 1660 which marked the start of the Restoration. 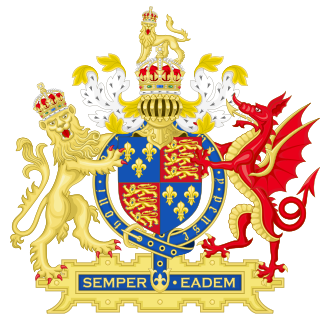 During the Interregnum, England was under various forms of republican government. 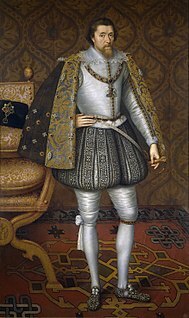 The Union of the Crowns was the accession of James VI of Scotland to the thrones of England and Ireland, and the consequential unification for some purposes of the three realms under a single monarch on 24 March 1603. 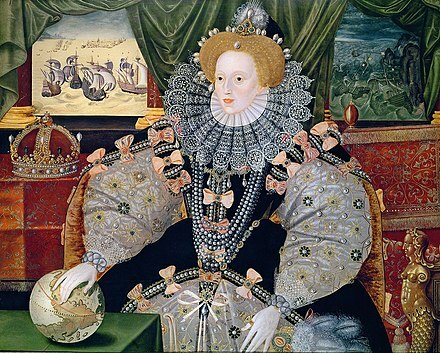 The Union of Crowns followed the death of Elizabeth I of England, the last monarch of the Tudor dynasty, who was James's unmarried and childless first cousin twice removed. The Anglo-Saxons referred to themselves as the Engle or the Angelcynn, originally names of the Angles. They called their land Engla land, meaning "land of the English", by Æthelweard Latinized Anglia, from an original Anglia vetus , the purported homeland of the Angles (called Angulus by Bede). 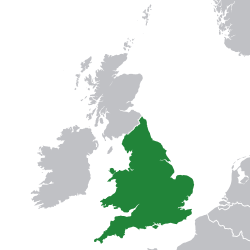 The name Engla land became England by haplology during the Middle English period (Engle-land, Engelond). The Latin name was Anglia or Anglorum terra, the Old French and Anglo-Norman one Angleterre. By the 14th century, England was also used in reference to the entire island of Great Britain. 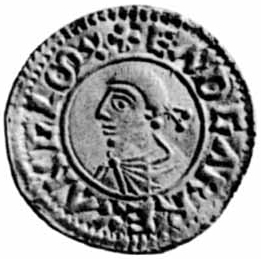 Æthelweard, descended from the Anglo-Saxon King Æthelred I of Wessex, the elder brother of Alfred the Great, was an ealdorman and the author of a Latin version of the Anglo-Saxon Chronicle known as the Chronicon Æthelweardi. 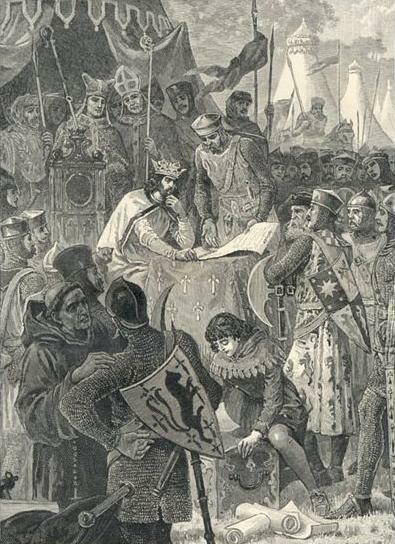 The peace lasted until the death of the childless Edward in January 1066. His brother-in-law was crowned King Harold, but his cousin William the Conqueror, Duke of Normandy, immediately claimed the throne for himself. William launched an invasion of England and landed in Sussex on 28 September 1066. Harold and his army were in York following their victory against the Norwegians at the Battle of Stamford Bridge (25 September 1066) when the news reached him. He decided to set out without delay and confront the Norman army in Sussex so marched southwards at once, despite the army not being properly rested following the battle with the Norwegians. 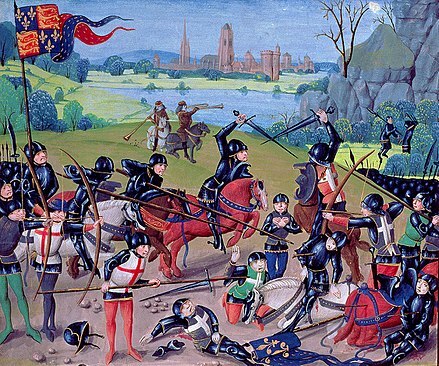 The armies of Harold and William faced each other at the Battle of Hastings (14 October 1066), in which the English army, or Fyrd , was defeated, Harold and his two brothers were slain, and William emerged as victor. William was then able to conquer England with little further opposition. He was not, however, planning to absorb the Kingdom into the Duchy of Normandy. As a mere duke, William owed allegiance to Philip I of France, whereas in the independent Kingdom of England he could rule without interference. He was crowned on 25 December 1066 in Westminster Abbey, London. 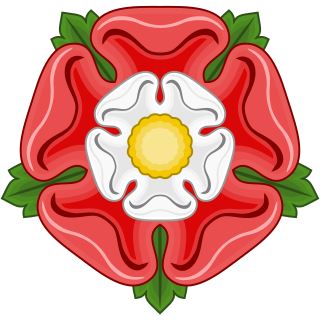 Unlike the partly self-governing boroughs that covered urban areas, the counties of medieval England existed primarily as a means of enforcing central government power, enabling monarchs to exercise control over local areas through their chosen representatives – originally sheriffs and later the lord-lieutenants – and their subordinate justices of the peace. Counties were used initially for the administration of justice, collection of taxes and organisation of the military, and later for local government and electing parliamentary representation. Some outlying counties were from time to time accorded palatine status with some military and central government functions vested in a local noble or bishop. The last such, the County Palatine of Durham, did not lose this special status until the 19th century. The power of the feudal barons to control their landholding was considerably weakened in 1290 by the statute of Quia Emptores . Feudal baronies became perhaps obsolete (but not extinct) on the abolition of feudal tenure during the Civil War, as confirmed by the Tenures Abolition Act 1660 passed under the Restoration which took away knight-service and other legal rights. Tenure by knight-service was abolished and discharged and the lands covered by such tenures, including once-feudal baronies, were henceforth held by socage (i.e. in exchange for monetary rents). The English Fitzwalter Case in 1670 ruled that barony by tenure had been discontinued for many years and any claims to a peerage on such basis, meaning a right to sit in the House of Lords, were not to be revived, nor any right of succession based on them. The Statute of Rhuddlan in 1284 followed the conquest of Wales by Edward I of England. It assumed the lands held by the Princes of Gwynedd under the title "Prince of Wales" as legally part of the lands of England, and established shire counties on the English model over those areas. 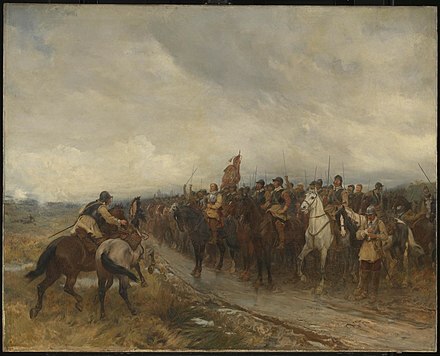 The Marcher Lords were progressively tied to the English kings by the grants of lands and lordships in England. 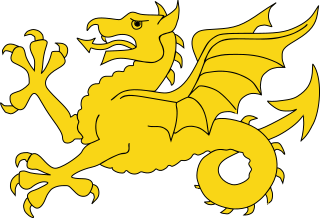 The Council of Wales and the Marches, administered from Ludlow Castle, was initially established in 1472 by Edward IV of England to govern the lands held under the Principality of Wales. and the bordering English counties. It was abolished in 1689. Under the Laws in Wales Acts 1535–1542 introduced under Henry VIII, the jurisdiction of the marcher lords was abolished in 1536. 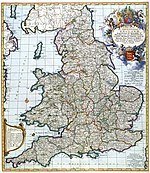 The Acts had the effect of annexing Wales to England and creating a single state and legal jurisdiction, commonly referred to as England and Wales. ↑ The Constitution of the United Kingdom, with the reservation that it is "uncodified", is taken[ by whom? ] to be based in the Bill of Rights 1689. England became inhabited more than 800,000 years ago, as the discovery of stone tools and footprints at Happisburgh in Norfolk has revealed. The earliest evidence for early modern humans in North West Europe, a jawbone discovered in Devon at Kents Cavern in 1927, was re-dated in 2011 to between 41,000 and 44,000 years old. Continuous human habitation in England dates to around 13,000 years ago, at the end of the last glacial period. The region has numerous remains from the Mesolithic, Neolithic, and Bronze Age, such as Stonehenge and Avebury. In the Iron Age, England, like all of Britain south of the Firth of Forth, was inhabited by the Celtic people known as the Britons, including some Belgic tribes in the south east. 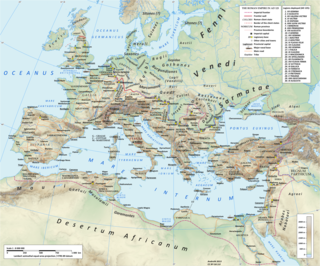 In AD 43 the Roman conquest of Britain began; the Romans maintained control of their province of Britannia until the early 5th century. Early modern Britain is the history of the island of Great Britain roughly corresponding to the 16th, 17th, and 18th centuries. 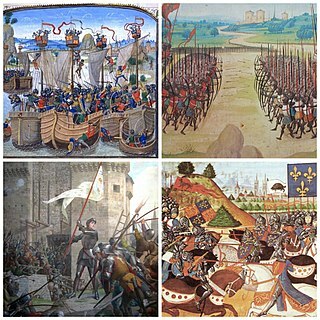 Major historical events in Early Modern British history include numerous wars, especially with France, along with the English Renaissance, the English Reformation and Scottish Reformation, the English Civil War, the Restoration of Charles II, the Glorious Revolution, the Treaty of Union, the Scottish Enlightenment and the formation and collapse of the First British Empire. English nationalism is the nationalism that asserts that the English are a nation and promotes the cultural unity of English people. In a general sense, it comprises political and social movements and sentiment inspired by a love for English culture, language and history, and a sense of pride in England and the English people. English nationalists often see themselves as predominantly English rather than British. Although in the past the style of British Emperor has been (retroactively) applied to a few mythical and historical rulers of Great Britain, Ireland or the United Kingdom, it is sometimes used as a colloquialism to designate either Plantagenet and Tudor caesaropapism or, more frequently, the British sovereign of the Empire of India. The Norman invasion of Wales began shortly after the Norman conquest of England under William the Conqueror, who believed England to be his birthright. Initially (1067–1081), the invasion of Wales was not undertaken with the fervor and purpose of the invasion of England. However, a much stronger Norman invasion began in 1081 and by 1094 most of Wales was under the control of William's eldest son, King William II of England. The Welsh greatly disliked the "gratuitously cruel" Normans and by 1101 had regained control of the greater part of their country under the long reign of King Gruffudd ap Cynan, who had been imprisoned by the Normans for twelve years before his escape. Gruffudd had some indirect help from King Magnus III of Norway who attacked the Normans briefly off the Isle of Anglesey in northwest Wales near Ynys Seiriol, killing Hugh of Montgomery, 2nd Earl of Shrewsbury and leaving the Normans depleted and demoralized. Magnus went on to take the Orkney Islands, the Hebrides, and the Isle of Man, islands north of Wales and west and north of Scotland and England, in 1098. Henry Royston Loyn, FBA, was a British historian specialising in the history of Anglo-Saxon England. His eminence in his field made him a natural candidate to run the Sylloge of the Coins of the British Isles, which he chaired from 1979 to 1993. He was Professor of Medieval History in the University College of South Wales and Monmouthshire and afterwards Professor of Medieval History at Westfield College in the University of London. ↑ "The Royal Coat of Arms" . Retrieved 19 November 2018. ↑ Crépin, André (2004). "Quand les Anglais parlaient français". Comptes-Rendus des Séances de L Année - Académie des Inscriptions et Belles-Lettres. 148 (4): 1569–1588. doi:10.3406/crai.2004.22809 . Retrieved 28 November 2018. ↑ "Les anglais parlent...français !" . Retrieved 28 November 2018. ↑ "Les Anglais parlent-ils normand ?" . Retrieved 28 November 2018. ↑ London, 800–1216: The Shaping of a City, "...rivalry between City and government, between a commercial capital in the City and the political capital of quite a different empire in Westminster. ", accessed November 2013. ↑ Stephen Harris, Race and Ethnicity in Anglo-Saxon Literature, Studies in Medieval History and Culture, Routledge, 2004, 139f. ↑ The Anglo-Saxon Chronicle Freely licensed version at Gutenberg Project. Note: This electronic edition is a collation of material from nine diverse extant versions of the Chronicle. It contains primarily the translation of Rev. James Ingram, as published in the Everyman edition. ↑ Vision of Britain – Type details for ancient county. Retrieved 19 October 2006. ↑ Youngs, Frederic A, Jr. (1979). Guide to the Local Administrative Units of England, Vol.I: Southern England. London: Royal Historical Society. pp. xii–xiii. ISBN 978-0-901050-67-0. Ancient County: Counties are geographic entities whose origins reach back into the pre-Conquest period. 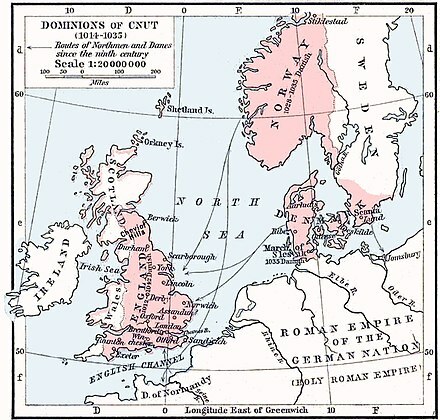 They were derived either from Anglo-Saxon kingdoms whose size made them suitable administrative units when England was unified in the tenth century, or as artificial creations formed from larger kingdoms. The number of 'shires' (the Anglo-Saxon term) or 'counties' (Norman term) varied in the medieval period, particularly in the north of England. ↑ Chandler, J. A. (2007). "Local government before 1832". Explaining Local Government: Local Government in Britain Since 1800. Manchester: Manchester University Press. p. 2. ISBN 978-0719067068. ↑ Hackwood, Frederick William (1920). The Story of the Shire, being the Lore, History and Evolution of English County Institutions (PDF). London: Heath Cranton Limited. ↑ Byrne, Tony (1994). Local Government in Britain. Harmondsworth: Penguin Books. ISBN 978-0-14-017663-6. ↑ Vision of Britain – Census Geographies. Retrieved 19 October 2006. ↑ Winchester, Angus J L (1990). Discovering Parish Boundaries. Oxford: Shire Publications. ISBN 978-0-7478-0060-6.